Karl Marx, 1818-1883. Born in Trier, Prussia, Marx studied Political Economy and Hegelian Philosophy. As a philosopher, economist and revolutionary socialist, Marx and his collaborator, Friedrich Engels, published The Communist Manifesto in 1848. A guide to ‘class struggle’ and the ‘capitalist mode of production,’ the pamphlet attempted to instigate communist revolutions across Europe. In his a later years Marx wrote Das Kapital, which further developed his ideas of ‘capitalism,’ ‘exploitation of labour’ and ‘surplus value.’ It was not only a critique of the Classical economists of the age, but also an attempt to measure his work scientifically, to reveal the “laws of motion of modern society.” His ideas and writings have been encapsulated in the term “Marxism,” and has influenced many, including Lenin. Nicholas II, 1868-1918. Born into the Romanov dynasty, Nicky, became Tsar of the Russian Empire in 1894, and ruled at a time of dramatic political and social change in Europe. In 1894, he married Alexandra Feodorovna, a German princess and granddaughter of Queen Victoria. As a family man, he spent most his time with his 4 daughters and son, rather than on the affairs of state. Alexei, the Tsarevich was a haemophiliac, and this became a contentious issue regarding the succession of the monarchy. Blloody Sunday was a momentous event in Russian history. Priest George Gapon led a peaceful protest with workers and peasants to the Winter Palace. 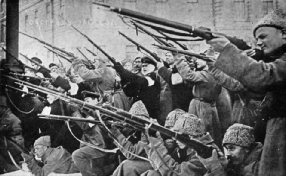 Police and soldiers shot and killed 92 people, which stained the Tsars name, leading to the moniker, “Nicholas the Bloody.” Defeated by the Japanese in the 1904-05 war, these events established a constitutional arrangement between the Tsar and Duma in the 1905 Revolution. Nicholas II took command of the Army during the First World War after huge defeats by the Germans on the Eastern Front. With massive shortage supplies at home, and for the armies fighting on the Eastern Front, Nicholas II not only prohibited alcohol for the troops but also failed to recognise the revolutionary activity in the heart of the Motherland. Initially offering Grand Duke Mikhail the throne instead of Alexei, Nicholas’ brother declined the offer, who wanted the people to choose their ruler. Nicholas II abdicated on 15th March 1917. Nicholas II and his family were executed in Yekaterinburg by Yakov Yurovsky on 17th July 1918. The order was given by Lenin. Josef Vissarionovich Stalin, 1878-1953. Born in Gori, Georgia, Stalin’s childhood was marred by poverty and abuse. At school, he excelled academically, wrote poetry and sung in the Church Choir. At the behest of his teacher, Stalin enrolled in the Tbilisi Spiritual Seminary as a trainee priest. Faltering academically, disillusioned with the seminary, Stalin’s attention focused on the readings of Chernyshevsky’s What is to be Done? and Marx’s Kapital. Stalin began organising secret workers meetings and joined a Georgian revolutionary group in 1898. He joined the Georgian RSDLP in 1901, but was soon arrested for worker strikes and mass demonstrations in 1902. Exiled to Siberia, Stalin escaped twice, reaching Tbilisi to continue his crusade. He met Lenin in 1905 and sided with the Bolshevik faction. In 1917 he became the editor of Pravda, the official voice of the Bolshevik newspaper. As Lenin and other Bolshevik members were in exile, he initially supported the Provisional Government. On Lenin’s return, however, he began promoting the overthrow of the government. In April, he was elected to the Central Committee Bureau and a key member of the Bolsheviks who coordinated the coup in the October Revolution. Lenin – Vladimir Ilyich Ulyanov, 1870-1924. Lenin studied Law at Kazan Imperial University, where he became politically radicalised. Influenced heavily by Nikolai Chernyshevsky’s revolutionary novel What is to be Done? and Marx’s Capital, Lenin was expelled by the university for political agitation. As a political agitator and asserting his intellectual abilities, Lenin continued to read revolutionary material. After spending 3 years in Siberia, he was then exiled to Western Europe, living in Munich, Geneva and London. Lenin developed his political theory and published many works including the political pamphlet What is to be Done? in 1902, Imperialism, The Highest Stage of Capitalism and April Theses, both in 1917. As a member of the Russian Social Democratic Labour Party (RSDLP), Lenin began asserting his leadership credentials. After a split in the party at the 1903 Second Party Congress, he headed the Bolshevik Faction of the party, underling the inherent ideological differences in the revolutionary struggle between different types of socialism. Playing no part in the 1905 Revolution, Lenin and his Bolshevik Party was given another opportunity after the Tsar’s abdication in 1917. He orchestrated the coup which established the first Communist state in the 1917 October Revolution. Philip Boobbyer read Modern Languages at Trinity College Cambridge (1982-86), before doing an MA in Russian Areas Studies at Georgetown University, Washington DC (1986-88), and a PhD in the Department of Government at the London School of Economics (1989-1992). After temporary appointments at the University of Westminster and the LSE, he came to the University of Kent in 1995. His work has mainly been on Russian intellectual history, and on the interaction of religion and politics in the 20th century. His first book, S.L.Frank: The Life and Work of a Russian Philosopher 1877-1950 (1995) was a study of one of Russia's foremost religious philosophers. This was followed by a textbook, The Stalin Era (2000), and then Conscience, Dissent and Reform in Soviet Russia (2005), which explores the ethical thinking of Soviet dissidents and Communist Party reformers and its contribution to the collapse of the Soviet Union. More recently, his book The Spiritual Vision of Frank Buchman (2013) is a study of an American religious leader who was well-known for his legacy in the field of reconciliation and interfaith dialogue. Lenin, who returned to Russia via sealed train, attempted to exploit this situation. The Russian people rejected Lenin’s proposals at this time and the Bolsheviks lost much influence in the revolutionary struggle. To undermine the Bolsheviks further, the Provisional Government provided evidence of Lenin’s close political and economic ties with Germany. Bolshevik property was destroyed, with members arrested, Lenin fled into exile in Finland and Leon Trotsky was jailed. Although the Provisional Government reasserted its power through its new Prime Minister Alexander Kerensky, it was still weak. Lavr Kornilov, Imperial Army General, who thought the Petrograd Soviet was militarily too strong, attempted a Military Coup. The Petrograd Soviet, being aware of the attempted coup, reacted swiftly, with Kornilov being arrested and imprisoned for his actions. However, through the Petrograd and Moscow Soviets, Bolshevik influence began steadily, to increase. It was their message of ‘peace, land and bread’ that realigned peasants and workers back to the Bolshevik cause. 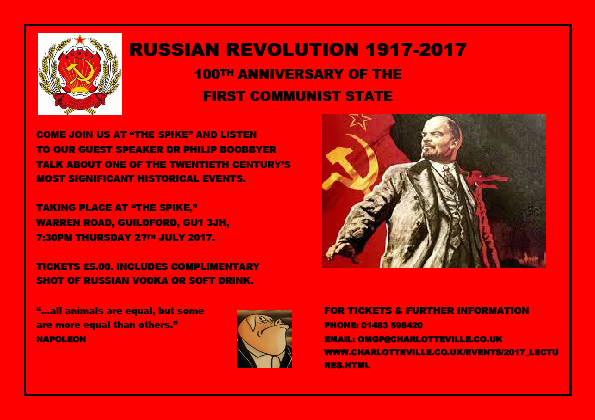 It was the Bolshevik’s use of the Military Revolutionary Committees that would eventually topple the Provisional Government in October 1917. Defending themselves against the actions of the government, these ‘committees’ cried “All Power to the Soviets,” with the intention of establishing a coalition socialist government. In the Second Congress of the Soviets, Lenin out-manoeuvred the other socialist parties and established the “Council of People’s Commissars.” A single-party state had been established. The Bolsheviks then consolidated their power by closing down all non-socialist newspapers, halting the elections of popular socialist party’s and through their own security police, the Cheka, would crack down on any counter-revolutionary behaviour. A violent and bloody civil war would ensue between, 1917-1922. The new Communist Party would triumph over the anti-Bolshevik forces and gain control over the former territory of the Russian Empire, creating the Union of Soviet Socialist Republics.